One thing about starting a new family is getting exposed to a new generation of children’s entertainment. Or, sometimes, the re-packaging of the previous generation's. I have two daughters in their twenties and of course they saw all the Disney movies, including those centering on traditional fairy tale princesses, but they misses out on the whole Disney Princess phenomenon. Thankfully! But if Disney has created a problem--and, yes, it would be silly to lay the whole thing at Disney’s feet--they are also providing a solution in a new series of movies starring Tinker Bell and the fairies of Pixie Hollow. I saw the first two of these movies before our trip to Disney World, but didn’t recognize their potential until we were there. The nice thing about going there at the end of September is how much the crowds have thinned. We rarely waited more than ten minutes for anything. We may have waited fifteen to meet actresses dressed as Princess characters, and I did see a sign saying that the wait to go on the Peter Pan ride was then thirty five minutes, but we had gone earlier and been on the ride in less than ten minutes. No, if line ups are any measure of demand the biggest thing at Disney World was Pixie Hollow. We actually stood in line an hour so the girls (we also took our granddaughter Talia) could meet three actresses dressed as the fairies Fawn, Tinker Bell, and Vidia. I heard a lot of parents muttering about how they couldn’t believe how long it was taking, but I didn’t hear a single complaint from the kids; ours or anyone else’s. 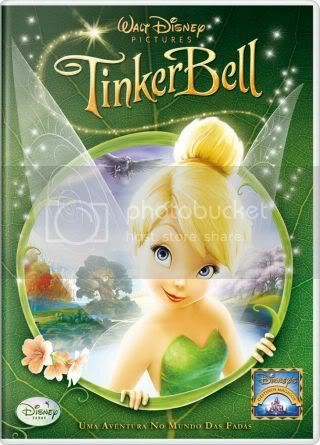 origins of Tinker Bell, her birth and how she became a tinker. In the world of Pixie Hollow, where the fairies are hard at work bringing about the changes of the seasons (painting the leaves for autumn, teaching the baby birds to fly in the spring, etc) newborn fairies are presented with the sigils of each fairy guild. The one that reacts most strongly to the fairy’s presence defines that fairy’s role. There are animal fairies, light fairies, water fairies, garden fairies, fast flying (air/wind) fairies, and there are tinker fairies. While the other fairies take what they have prepared out of Pixie Hollow and over to the mainland, the tinkers stay home and help prepare. They provide what the military would call logistical support. When Tinker Bell learns that she can’t go to the mainland, she is determined to develop a new skill, to become another kind of fairy, so that she can. After a great many comic misadventures, she learns to appreciate herself and her own gifts. 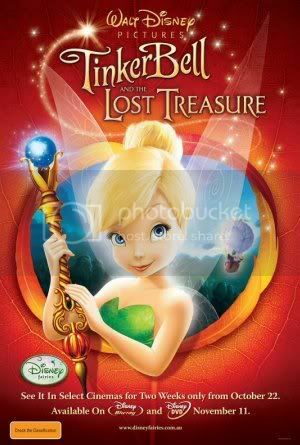 The second movie, Tinker Bell and the Lost Treasure (2009), sees her happily applying her considerable problem-solving skills and being given the privilege of creating the sceptre for the Blue Harvest Moon ceremony. Every eight years a blue harvest moon shines through the moonstone and creates blue pixie dust, which the pixie dust tree needs if it’s going to keep producing their supply of pixie dust. This dust is a valuable resource for the community, providing them with many of their powers. Without it, for example, a fairy can’t really fly. They just sort of hop about. Tinker Bell feels genuinely honoured to be given the task, but anyone who remembers the original Peter Pan will know that she has a notorious temper and when a friend of hers, the pixie dust keeper Terence (dust keepers seem to be a sub-group of the tinkers), tries to help, he ends up setting off that temper to ruinous results. If Tink is going to save the day, she’s going to have to start valuing her friends. What I like about these films is that the fairies, and the focus is on the female cast, are focused on their work and helping their friends and community. Tinker Bell is never going to marry Terence. It’s why I think they are an antidote to the Princesses and not just the Next Big Thing. They are characters who take pride in take pride in their accomplishments, in problem solving, and in helping one another. And they don’t waste time with all the girl power tag lines we’ve all grown so weary of. They simply do the job in front of them. As for the third movie, The Great Fairy Rescue, my wife and I sat down to watch it with Makayla and found ourselves laughing out loud more than once. It was fun. I am sure we’ll be watching it again (and again), but the story wasn’t as strong as the first two. 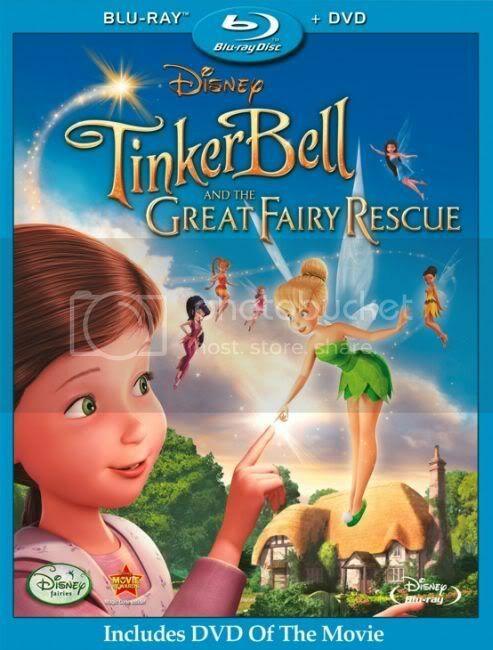 The main plot involves Tinker Bell being captured by a little girl named Lizzy. I am not sure what Tink is doing on the mainland. The whole point of the first movie was that she wasn’t able to go there. Lizzy is a girl that loves fairies and spends all her time fantasizing about them. Her father is the always busy, always preoccupied Dr. Griffins, who doesn’t believe in fairies or anything else without proof. Yes, it’s another little girl who just needs a little attention and another parent who just needs to believe. The motive of this movie, however, has nothing to do with the Griffins. It has to do with Vidia and Tinker Bell. As you might have noticed from the video above, these two characters aren’t exactly friends. Vidia is a fast flying fairy. She’s important, she knows it, and she finds Tinker Bell extremely annoying. If these stories were set in a high school, Vidia would be the Queen Bee. She is not a villain. She is not a bad person--fairy--but she is obviously intended to be Tink’s antagonist. There are two problems with this. First, because Disney had the courage to play her character straight. Kids know she isn’t a villain. She’s the best and she knows it, and that comes off as snobbish, but little children have a strong sense of pecking order. They seem hard wired to defer to the oldest, the strongest, the ‘best’, even if they don’t want to, or don’t like the other kid. They may not like the trouble she causes Tink and they may be glad when she gets in trouble, but that doesn’t mean they aren’t attracted to her in much the same way school children will seek the approval of the class Queen. Second, of all the fairies Vidia and Tinker Bell have the strongest personalities. Tink has four other friends. Rosetta, a flower fairy, has a Southern accent and Iridessa, a light fairy, is black, but accents and skin colouring don’t really add much personality-wise. Both Fawn, an animal fairy, and Silvermist, a water fairy, seem more nurturing, but I could well be reading that into them, given the nature of their work. The truth Tink’s friends exists largely just to be friends and to encourage her when things aren’t going well. Tink and Vidia are the ones that make an impression and the point of this movie seems to be to create a détente between them. Even if Vidia isn’t going to become anther one of Tinker Bell’s BFFs, most mothers don’t want their daughters trying to emulate a snob. (Trust me.) The next movie is due out in February and I am sure we’ll be watching it. I personally hope Vidia’s character remains unchanged. That she remains the oil to Tinker Bell’s vinegar. It adds a nice mix and one we often don’t see in the dumbed down world of children’s entertainment.